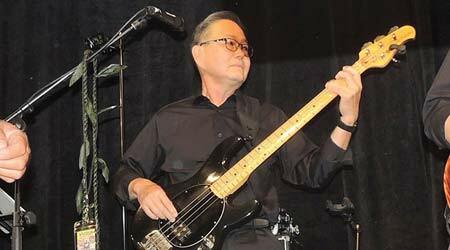 Robin Kimura of EKEA Sales and Marketing in Honolulu, enjoys playing music with his band. Robin Kimura has a long musical history. Robin, who is with EKEA Sales and Marketing, a manufacturers rep company in Honolulu, plays, organizes, performs and records music. It all started in 1972 when he got some friends together to start a band. He was 16 years old. The band, named “Greenwood,” played together until 1981, reconvened again briefly in 1984 to record a 45 RPM vinyl single, and was defunct again until 2005. He continues to organize the 70s Nightclub Reunion annually for an average sell-out crowd of 850 people. Three years ago, Greenwood recorded a 12-inch vinyl version of their 2014 album, “Lost in Paradise.” Robin says it started when he wanted an LP — a “long playing album” — for himself. There was a waiting list of four to six months to “press” a vinyl record. Despite the rise of digital downloads and streaming services, vinyl is quite popular. “In fact, in recent years, there has been double-digit growth annually in vinyl records,” says Robins. When the band pressed the “Lost in Paradise” LP, it had a modest run of about 500 copies. “A large record store chain in Japan took almost all of them. The Japanese market is our market. Because of the internet, people from Japan contact me on email and social media, and they ask for the lyrics in English,” says Robin. One Japanese fan even shared a story about a family member performing one of Greenwood’s songs at their wedding — in English. Robin says the band has songs that have been hits in Japan, including a song called “Sparkle” that was on the music playlist of both McDonald’s restaurants and a 14,000-location convenience store chain. Greenwood’s LPs are popular throughout the world. Besides Japan, they also have fans in China, the United Kingdom, Mexico and the Scandinavian countries. The band cut a 45 RPM vinyl after “Lost in Paradise,” featuring “Summer Sun” which was a hit in Japan in the 70s. “We pressed about 1,000 records. And they all went to Japan,” says Robin.